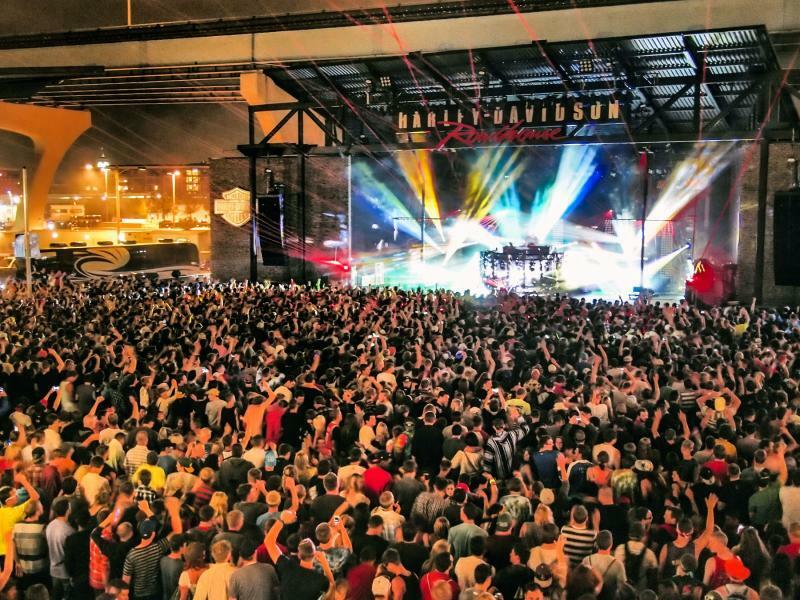 Here are all the headliners on the 2019 Summerfest lineup! Get more info. 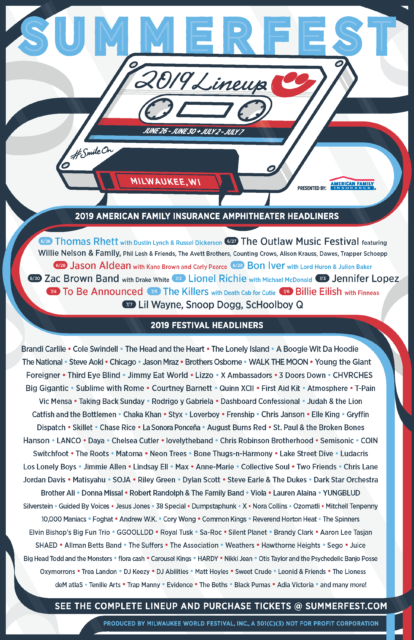 about the Summerfest 2019 lineup and buy tickets here. 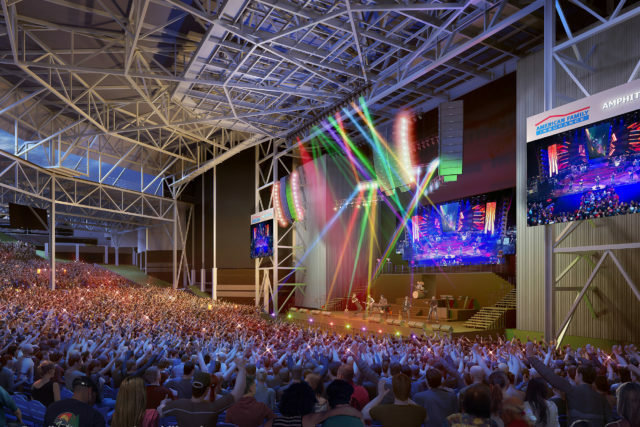 The new American Family Insurance Amphitheater will include an entirely new seating bowl configuration and raised stage to allow for better sight lines, enhanced accessibility, expanded concourses, new video screens, reimagined food and beverage operations, new VIP hospitality areas, additional restrooms and more. Before the the infamous DJ Jazzy Jeff brought the 90s nostalgia along with a dance party for the ages, there were three Milwaukee DJs on stage. Jordan “Madhatter” Lee kicked off the night, followed by DJ Bizzon. The finale was brought by DJ Kenny Perez. Though the three of them work together here at the station, they all pursue individual projects and entertain different types of sound. This year for the first time, they combined their ideas and performed together at Summerfest. Their choice to combine their individual strengths served as a catalyst for a legendary night. Together, the three of them painted a canvas of sound, colored with old school and contemporary hip hop, latin, reggae and soul. The longer they played, the larger the audience grew. However, it wasn’t just the sheer number of people or their enthusiasm that stood out to the performers. It was the diversity of the listeners. Our program director, DJ Jordan Lee says that he thought they drew in such a wide variety of people for the same reason 88Nine appeals to so many people. “If you put people in a box, you disenfranchise more people than you actually invite in.” Jordan said that the first thing he felt when seeing the crowd was joy. This is easy to appreciate when just outside of Summerfest is one of the most segregated cities in America. Yet, people of all ages, races, sizes and genders found one thing to agree on that night—music. 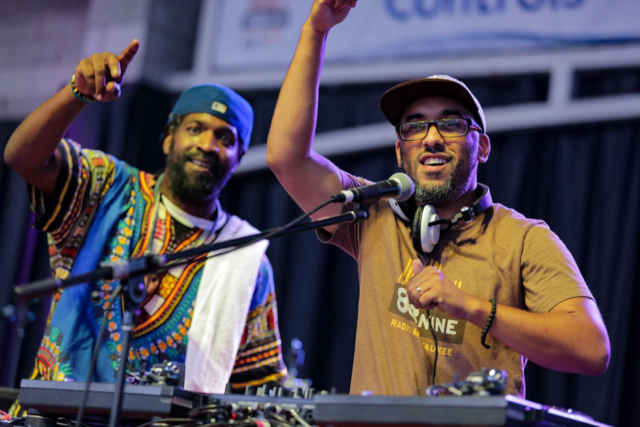 The DJ’s of 88Nine want to continue the legacy they left at Summerfest here at the station with one goal in mind: to bring people together through culture, diversity and sound. Michael has been coming to Summerfest for 10-12 years and he comes for all 11 days. He’ was seeing Dorothy; she’s an up-and coming-star out of L.A. and he said her voice warms his heart. Michael works at Renaissance fairs and started sporting his look there. 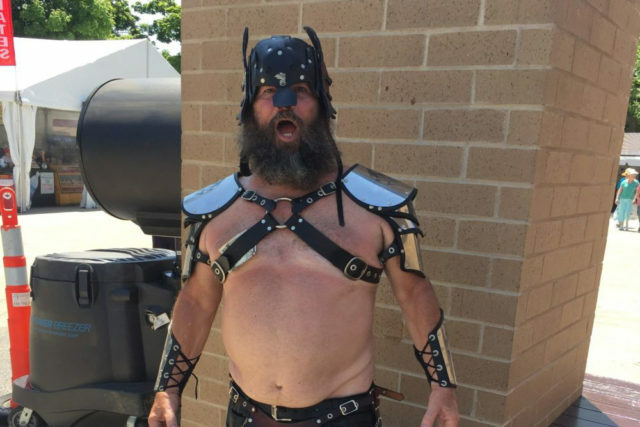 Being a cancer survivor, he realized he liked the attention and the positive feedback from others and it made him happy, so he started wearing it to Summerfest. One year for three days, then five, then nine, and this year he was shooting to wear it for all 11. Rock on! In line this morning we talked to Karen Drescher. 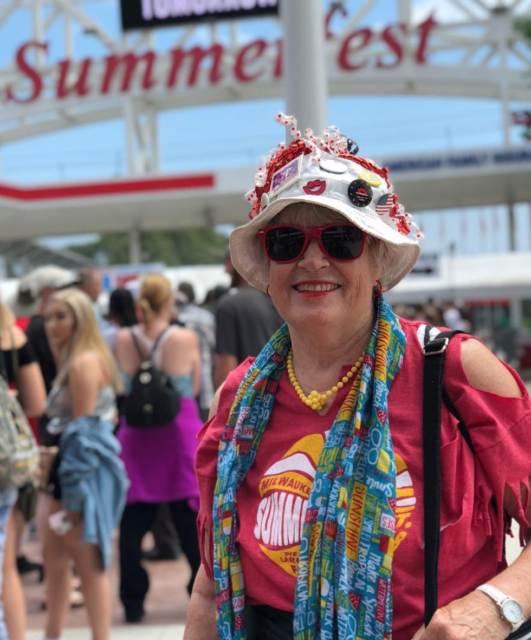 Karen said, “Summerfest saved my life.” She has had heart surgery half a dozen times including recently and she was in line at noon on opening day! Karen is our hero. We all know the iconic Catalanos lemonade stands at Summerfest, so it’s time to meet the people inside. Meet Kaitlyn and Megan. 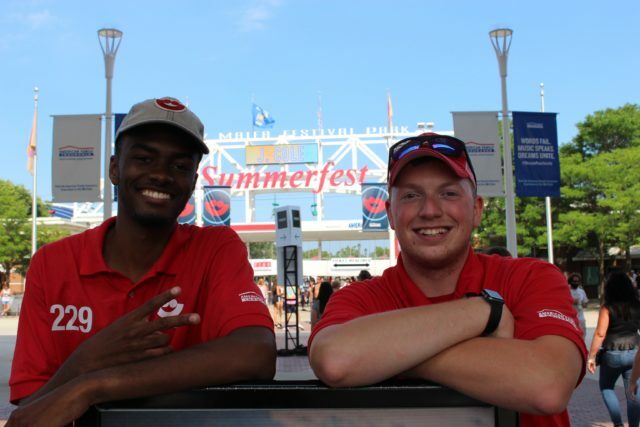 Kaitlyn has worked at Summerfest for four years, and this is Megan’s first. Both girls are students from Milwaukee. Kaitlyn attends Iowa State, and Megan, a high school student, is making plans to attend a state university in the Midwest. According to Megan, her arms get sore after about three hours of shaking up those ice-cold lemonades for customers. 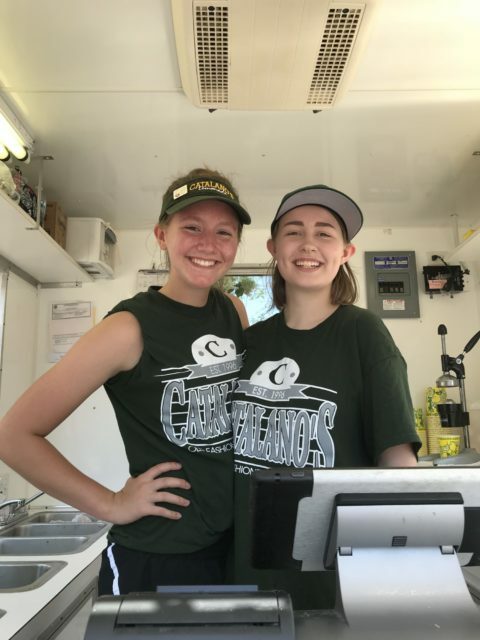 Despite the heat in and outside of the Catalanos tent, they both agree that they’re serving the best drink at the festival. Chicago locals Dave and Belia drove all the way up to Milwaukee for one day of Summerfest. 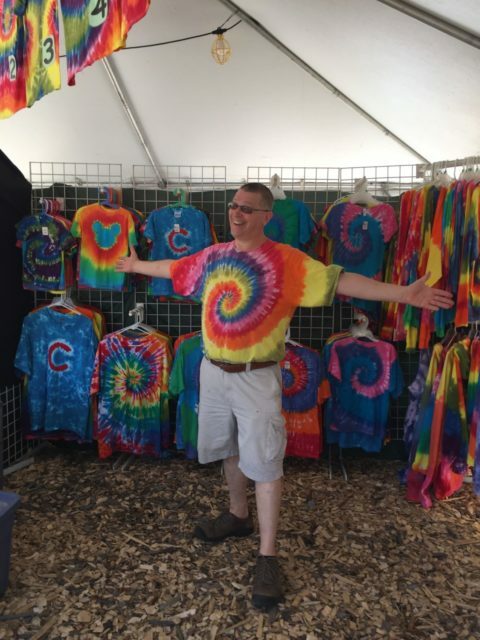 It was their first time attending the festival together, but Dave is a Summerfest veteran, having made the drive up multiple times in years past. He says Milwaukee music festivals are “cleaner and better” than those in Chicago (his words, not ours). Dave and Belia came to Summerfest on a mission to discover new music, an ambition near and dear to our hearts here at 88Nine. They said they’ll be back, so keep an eye out for our new friends from the Windy City at next year’s festival. Mickayla, an arts administrative worker from Chicago who was working at the Clifton Henry Photography tent for her first Summerfest. 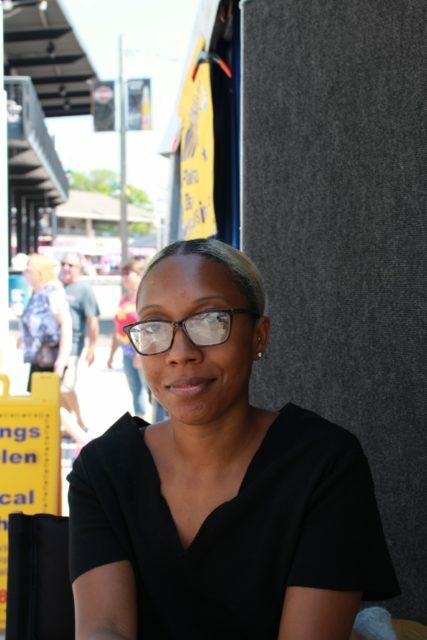 “I support artists, but I’m not creative myself,” she said of her job. 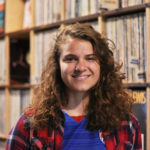 No stranger to Chicago music festivals, Mickayla attended Mamby On The Beach in June and is looking forward visiting Pitchfork Music Festival later this month. 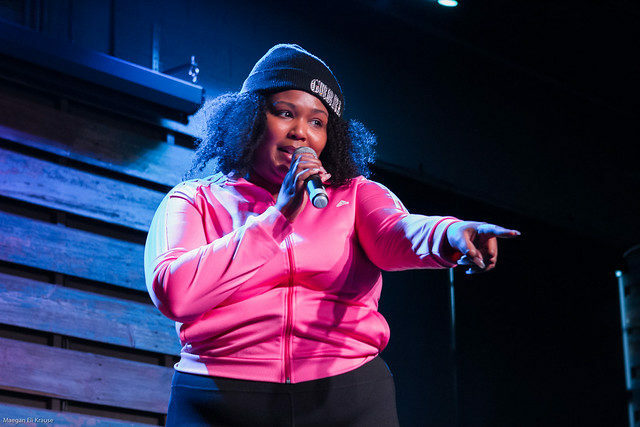 She mentioned J. Cole as a Summerfest favorite and recommends Smino to those unfamiliar with the Chicago artist. 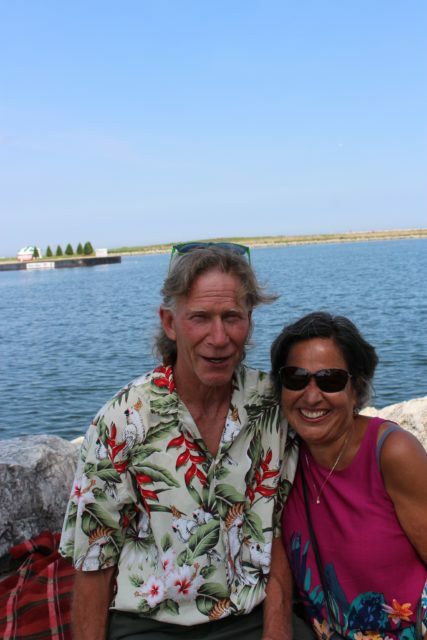 Tim Wifler has been traveling from Crete, Illinois to Milwaukee for Summerfest for the last 16 years. All Tyed Up has a tent near the Kid’s Play Zone where Tim and his employees tie dye with people of all ages. You can purchase any of the completed products or create one of your own! When asked if it’s a family business, Tim replied that “they all bleed rainbow but are not actually blood-related.” Their Facebook page is called All Tyed Up, so toss them a like. 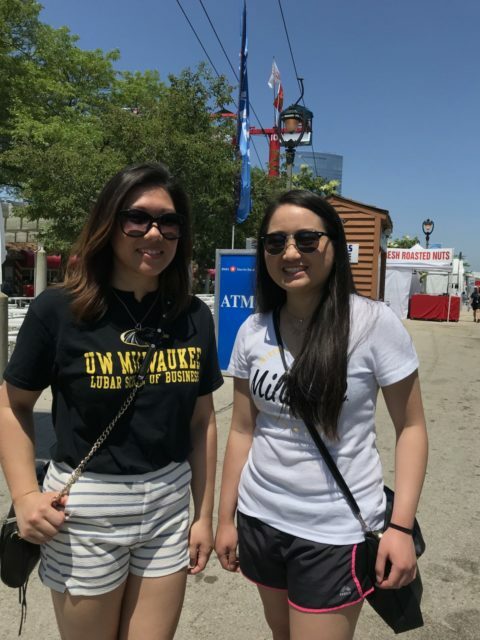 Chrystal and Melissa, first and second-time Summerfest goers, decided to visit the grounds for University Day. Both Milwaukee locals, Chrystal is studying Human Resources and Melissa is studying Marketing at UW-Milwaukee. They planned their visit to Summerfest early in the day, braving the heat in order to get out before the crowds file in. Good plan. We also met a human statue and a Summerfest shuttle driver. 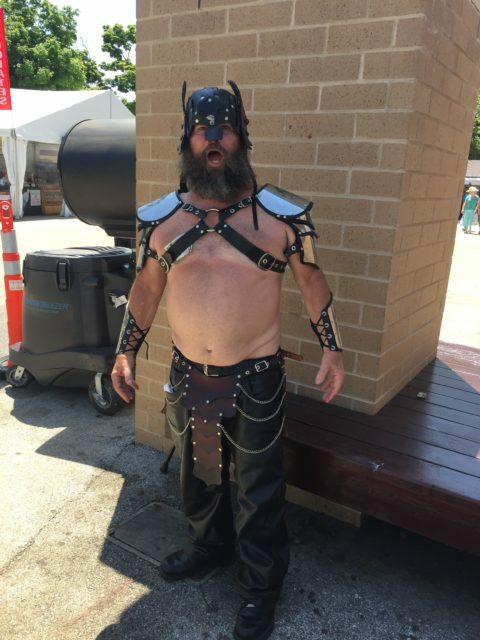 Did you meet interesting people this year at Summerfest? Share and tag them. 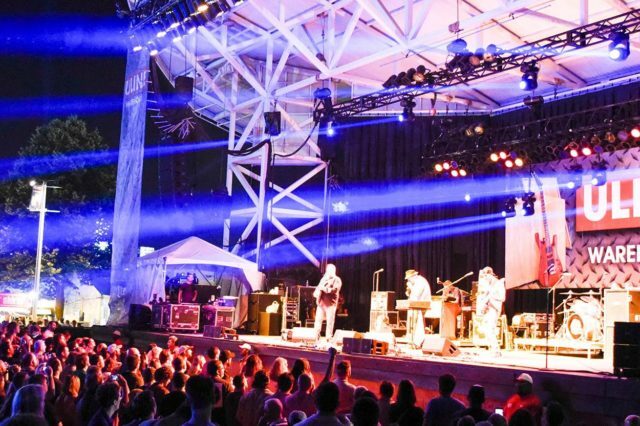 How does Summerfest book its acts? Scott Ziel: As my boss, Bob Babisch always says: “This event is a festival for the people.” It was started, you know, by the mayor for everybody, so we’re basically trying to present as many styles of music that we can, so that we can attract a very diverse audience. 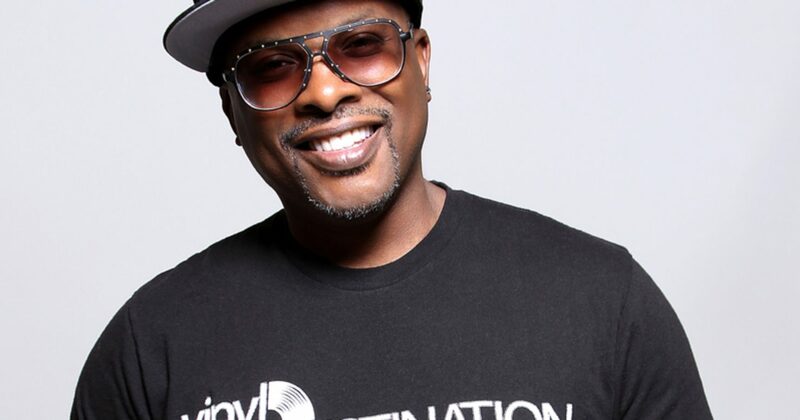 When we’re out, you know, beginning the booking process we’re looking for, you know, “OK, I want some Hip-Hop, I want some Indie Rock, I want some EDM, I want some Country, I want some Reggae, I want, you know, any style that we feel like is going to appeal to masses. So we kind of start with that philosophy. David Silbaugh: So we book from the top down. The headliners are the ones that are selling the tickets. 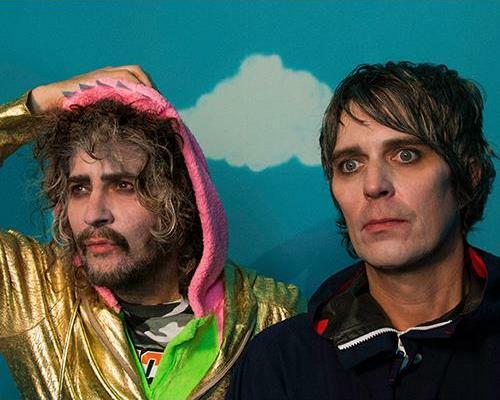 The headliners and support acts. It’s not that we don’t want other bands to be able to sell tickets… I don’t need that guarantee, which allows me to book baby bands that have never been through the market, or nobody’s heard of, or, you know, whatever. It allows me a lot of freedom and flexibility to play with the rest of the lineup. Bringing in up and coming talent from all over the place that maybe nobody knows. It gives me the opportunity to introduce people into new music and new artists that I think are worth checking out. We have eleven days to fill. So, we are going after a lot of stuff, and some of it is the same, but we cover a wider range stylistically, and we really try to adhere to that “something for everyone” kind of mindset, and try to keep a balance stylistically. Scott Ziel: Our team has to work for 12 months to put together the lineup that we’re presenting this year. There are probably three, four, five waves of booking that we do. From literally the day after Summerfest, we started working on this year’s lineup. We make a lot of offers, initially. A lot of bands really don’t know what they’re doing, you know, the country bands and the classic rock guys — they’re old, they like planning long in advance. David Silbaugh: And we pretty much put offers out for everything big. Everything big. And it just sort of whittles its way down. Some people are jumping at us, some people aren’t, they don’t know what touring is going to look like, you know, next year yet, some do, some don’t. Scott Ziel: Well, I mean we basically fight to get as many slots for Milwaukee bands and Wisconsin bands. It could be during the day. Clearly we’re trying to put Milwaukee bands in front of national bands at 6 p.m. or 8 p.m., if the headliner will approve it and if they’re not out touring with their own support. Like this year, a couple of the highlights, like B~Free is supporting Janelle Monáe. 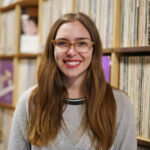 Abby Jeanne, who is direct support for Benjamin Booker, her song is in our television commercial that we’re using to advertise the festival, and she’s actually doing the voice over. In years past, I mean, GGOOLLDD has done that for us, so, we’re like, super proud, like, you don’t even know. 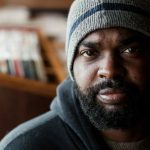 Scott Ziel: … and obviously the Emerging Artist Series is another vehicle to expose Milwaukee music. There’s nothing more exciting for us than to be watching a band develop. David Silbaugh: We just try to have a balance and give opportunities for local artists to be able to perform on a nice big stage with a great PA and great monitors and they’re not tucked into the corner of a tiny club, and also give them opportunities to be in front of bigger audiences and bigger bands. I’d like to think we’ve done a pretty good job of putting local bands on support spots, either first or second. David Silbaugh: It’s like the dust hasn’t even settled and the emails are coming in and the phones are ringing and agents are looking for offers for next year. So, it starts early. And again, some things we are already working on, and I have some ideas for some things I want to plug in that maybe wasn’t able to make work this year for whatever reason. MCTS buses will be available at 10 Park and Ride locations in Milwaukee and Ozaukee counties. 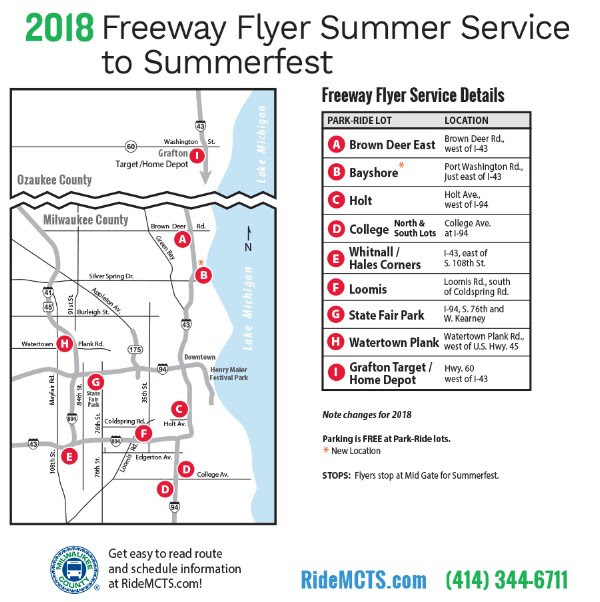 The new process will be similar with Freeway Flyer riders boarding the bus upon arrival at each lots, and then paying for their trip when they leave the bus and walk into Summerfest. The new transaction has been implemented to end the long lines and slow boarding from bus stops of past years, ensuring quicker rides. After getting off the bus, riders will be directed to MCTS ticket booths where they will pay for round-trip fare and receive a wristband for the bus ride back at the end of each night. When leaving the grounds, if riders are only taking the bus back, they must still pay full round-trip fare at the MCTS ticket booths. Riders can pay for their trip with cash, credit card, the MCTS M•CARD or Pre>Fare – the MCTS digital ticket. Of the 10 Park and Ride lots, MCTS is welcoming back the Silver Spring Drive location near Bayshore Town Center after a 15 year hiatus. People will be able to park in the Park and Ride lot and on the third level of the Bayshore parking structure. Service will be provided on weekdays approximately every 30 minutes from 11:30 a.m. to 5 p.m. and approximately every 15 minutes from 5 p.m. to 12:30 a.m. On Saturdays and Sundays, service is roughly every 15-20 minutes. Times may be impacted by construction and peak traffic periods. The Downtown Shuttle will take riders directly to the Mid Gate of the festival grounds. Shuttle services will run the length of the festival from 11:30 a.m. to 12:30 a.m. daily at 20 minute intervals. 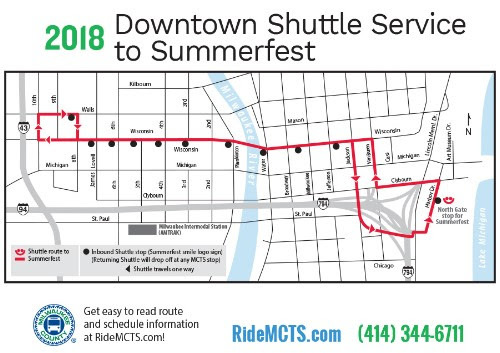 Bus stops run along both sides of Wisconsin Ave. from James Lovell St. to N. Jackson St.
Other Summerfest transportation along Routes 14, 15, the GreenLine and GoldLine will drop riders off within walking distance of the Summerfest grounds. Regular fares apply for local routes. No matter your transportation though, we hope you listen to as many bands and music genres as possible, dance a lot, eat too much delicious food and enjoy the lakefront breeze. 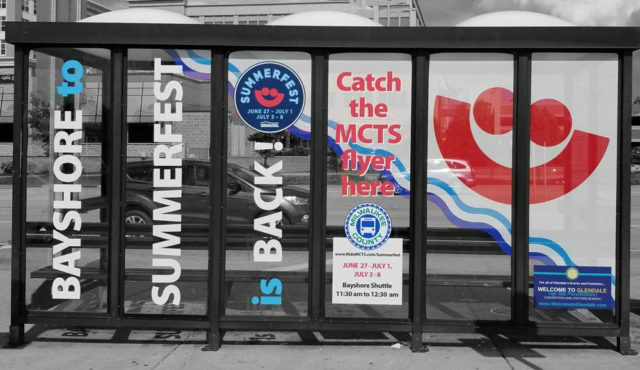 Get more information on fares, routes and service to Summerfest here. 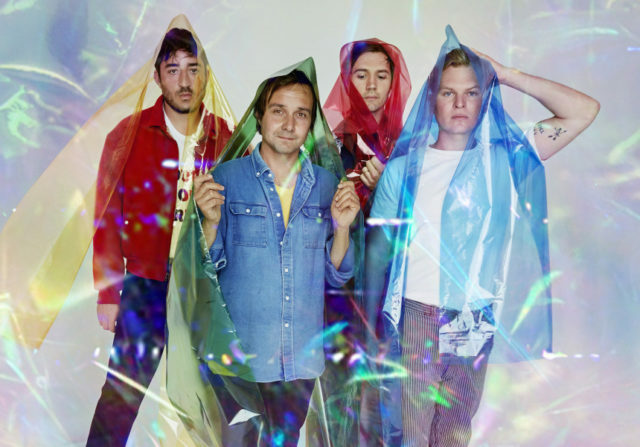 Summerfest dates and times announced for Grizzly Bear, Kaleo, Bishop Briggs and more! Here’s your last chance to experience the Uline Warehouse stage of your Summerfest memories. The new Uline Warehouse stage debuts in 2019! Start planning for The Neighbourhood, Aminé and a ton of rock shows.